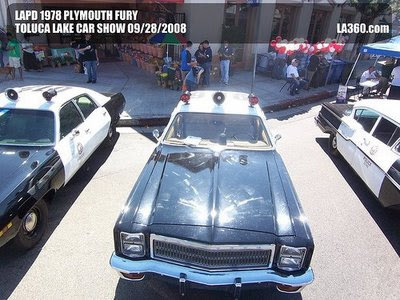 This V-8 powered sedan was the LAPD's patrol car of choice during the late seventies and early eighties. It was equipped with power steering and air conditioning. Mobile computers had not yet come along. The rooftop lights, with the forward-facing red and flashing amber to the rear, were retired from service in 1984. The influx of international visitors for the Olympic games required the addition of blue lights as this is the internationally recognized color for stopping vehicles. LAPD replaced the roof lights with light bars that included both red and blue lights. The roof number on the patrol car features the last three digits of its shop (fleet) number. The large white numbers on the trunk lid identify the station to which the vehicle is assigned. In this case the patrol car belonged to West Valley area. I luv dem police cars! whoop-whoop!